Galia Arad is a singer songwriter based in New York. Originally from Bloomington, Indiana. Her classical musician parents and classical voice training steered her directly into the arms of rock ‘n’ roll. 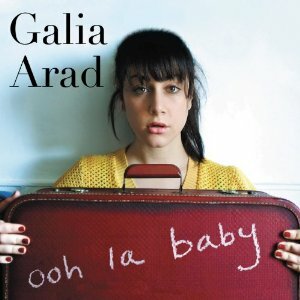 This is Galia Arad's second album (the first being "Sand in your bed"). It's a deceptively simple album - just her singing and playing acoustic guitar, but there's actually a lot more to the album than that. The album is a concept album and tells the story of a girl finding love with a young Irishman. The songs are superbly written with the story easy to follow through the songs and with plenty of emotion, warmth and at times bitterness. The guitar playing is nicely done so it never distracts focus away from Galia's lovely voice but instead merely complements it nicely. For me the only problem with the album is the duets with Shame MacGowan - "Four leaf clover boy" and "Full of sh*t". The character he's supposed to be is a young Irishman, but frankly he sounds like a washed up old drunk instead. I appreciate that his name will attract new people to listen to the album - it certainly raised my interest level, but I can't help feeling the songs would have been far better with a different singer replacing Shane MacGowan. An excellent album that I'm thoroughly enjoying listening to and one well worth a listen.